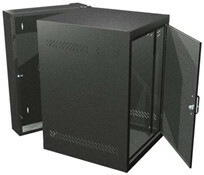 The Wall Mount Enclosures WD Series, GL36WDS is the same as GL36WD except solid door.This is the most versatile wall mount we have ever introduced. It features an optional "Dust Resistant Kit" that contains filters and panels to seal the vents and openings. This kit will be available for new and existing WD cabinets. The two pair of 12-24 mounting rails are fully adjustable. The unique hinge system allows removal of the rear section for easy installation. Casters are also available to make the WD free standing as well as hold extra weight.